I can’t take credit for this list. I found it on the blog of Kaye Dacus, a Christian Fiction writer who writes historical and contemporary Christian romances. Her Ransome trilogy is my favorite of hers so far (seriously, Regency, British navy, and pirates, what isn’t there to love?). Some of the letters on your keyboard are completely worn off. You would rather write than go out. Your/you’re and their/there/they’re errors send you into an apoplectic fit. You get cranky if you don’t get to write. In the middle of the night, you grab the pen and paper you keep next to your bed to write down a scene to make the voices be quiet so you can get some sleep. Getting the scene finished is more important than food, coffee, or the bathroom. A blank wall becomes the screen where the scene you’re writing takes place right in front of your eyes. You can’t write because you’re mad at one of your characters. You argue with said character. The “sermon notes” section of the Sunday morning bulletin comes home every week filled in with ideas or scenes for your WIP. You–hold on, I have to check my e-mail . . .
You do everything you can think of to procrastinate from writing, then turn the light on in the middle of the night and furtively write a few hundred words because you feel guilty for not writing. You can predict the next line or conflict in just about every TV show/movie you watch. You stay in bed ten minutes after you wake up structuring the details of your dream into a novel synopsis, complete with character descriptions, setting, and costumes. You spend more on “writing stuff” every year than you do on groceries and gas combined. You’re never bored, because your characters are always there to entertain you. You aren’t concerned when someone else talks about “the voices” not leaving them alone—in fact, you ask them about their voices and tell them about your own. You know more than ten verbs to describe the way someone walked into the room. Poorly written novels make you bipolar—elated knowing that you’re a better writer, and depressed because that hack got published and you can’t get past the acquisitions editor. It takes you forever to send a text message on your cell phone because it has to be properly spelled and punctuated. You see a hand-drawn employee appreciation poster at the grocery store with one word misspelled and have to avert your eyes every time you walk past it to keep from attacking it with a red Sharpie. You are automatically drawn to the display of journals and fancy notepads/notebooks on the bargain table at every bookstore you enter. And you buy at least two, because you don’t have any in that style yet, even though you have at least fifteen or twenty sitting at home unused. You go into mourning when you kill off a character . . . even if the character deserved to die. You’ve figured out how to write while driving. And have actually missed your exit/turn because you’re so absorbed in your own story. At parties, some people snoop in the medicine cabinet. You sneak peeks at the bookshelves. You read a list of “you know you’re a writer if…” statements and think of twenty others not covered. Aren’t these awesome! There were so many that Kaye Dacus compiled that I didn’t include them all. There were just my favorites (and no, I’m not going to admit how many I do on a regular basis. If you’re a writer, you can probably guess without being told). Which ones are your favorite? 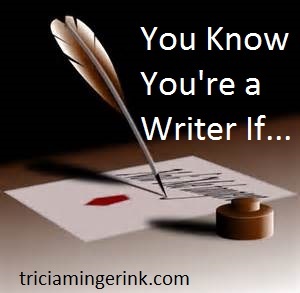 Did you think of any “You Know You’re a Writer if…” statements to add? And, lastly, congratulations to Miquel, the winner of the A Time to Die giveaway! You should have received an email this morning. If you didn’t, please contact me. Thanks to everyone who entered! Haha! Too funny. And maybe a little too close to home! So true! Though I don’t actually do all of those. (Surprise!) The most annoying is definitely waking up at night with plot ideas. I always get my best idea when I go to bed, ‘sigh’.